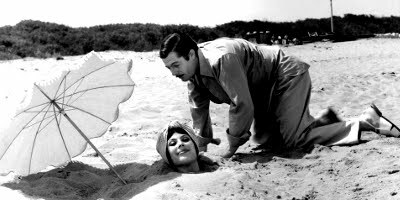 Pietro Germi directs Marcello Mastroianni and Daniela Rocca in this comedy that came in the wake of Neo-Realism but contained within it the seeds of so many comedies to come especially those of the Sins Within The Family type that concentrated on the hypocricy of bourgeois family morals. Winning an Oscar for the writing and in receipt of many other awards Divorzio all'italiana is not just painfully funny and incredibly well written it is perfectly paced too. It also rather playfully makes a number of serious points about society, it's values and politics. The film inspired the title Divorce American style from later in the decade and cultural references include a screening of La Dolce Vita, a meeting of the Partito Comunista Italiano is shown and a priest calls for a vote for a party that is both Christian and Democratic as the great and the good of village life are shown relaxing outside a bar owned by the Christian Democratic Party. There are also allusions to the idea that the judiciary will favour an aristocrat even where he may be one fallen from grace somewhat. A film not to be missed.